My boys are giving me that “you don’t know me at all” look. 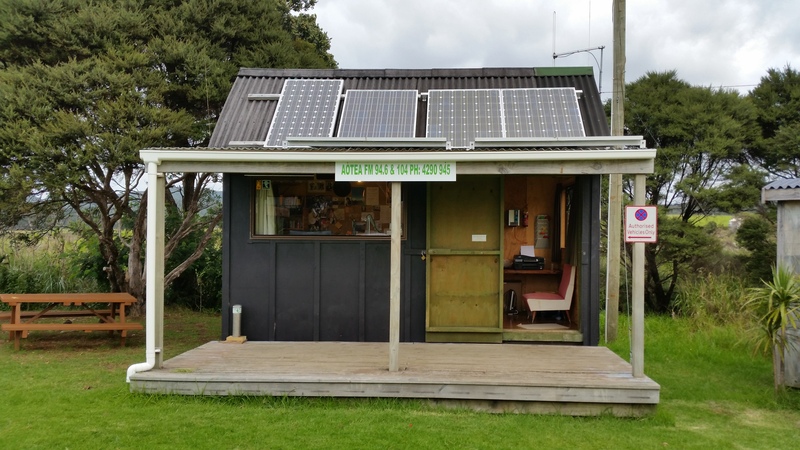 We’ve rented a cabin on Great Barrier Island, an island north of the Coromandel Peninsula in New Zealand, and we’ve opted for economic accommodation – possibly unwisely. The boys’ eyes have widened. The enormity of a week without their iPads has been hard for them to accept, but the thought of sharing a kitchen and toilet block with strangers is testing their limits. 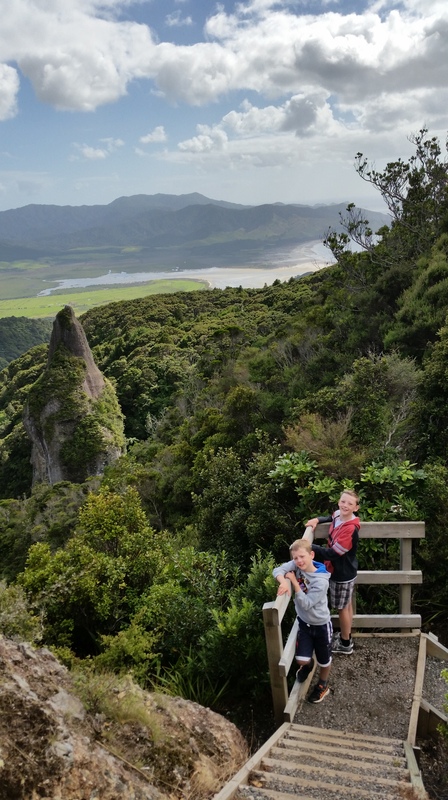 This trip was planned as a week to get from it all, but I think my boys were quite keen to bring it all with them. It’s been an early start today with Sam’s watch unnecessarily waking me in the middle of the night, followed by final packing, arrival at 6.50am at the wrong dock, and then 7.05am at the right dock. At 7.10 we’re the first car to drive onto the ferry, and being the first I forget that I should have reversed on. Fortunately there’s enough time to turn around without anyone getting impatient. The ferry leaves just before 8am, and I enjoy watching my phone reception disappear. I’m now out of the clutches of my clients and work colleagues, so the holiday can begin. 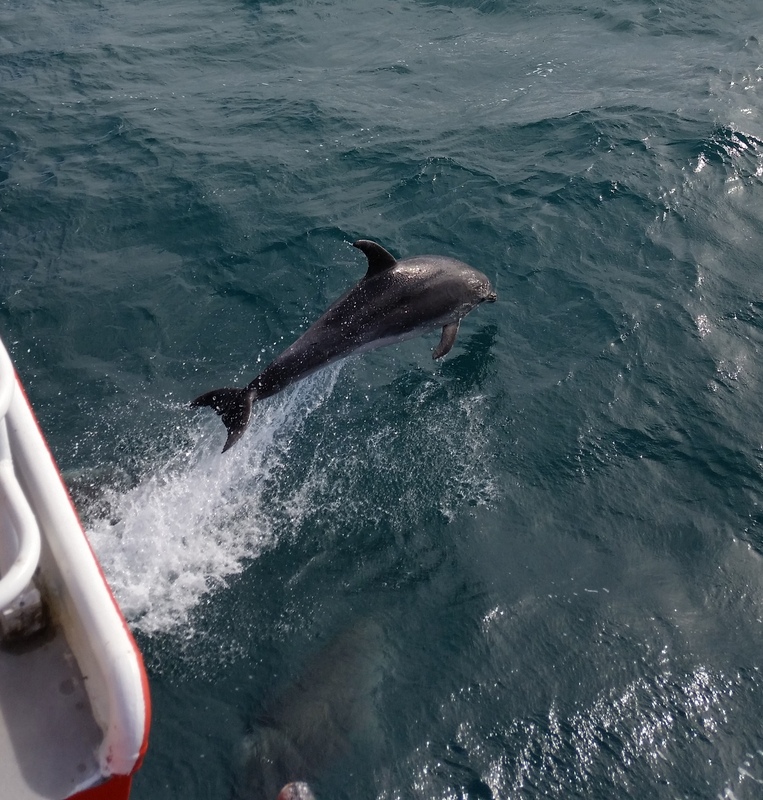 The ferry trip takes four and a half hours, and the highlight for the boys is a small pod of dolphins that leads us across to Great Barrier. 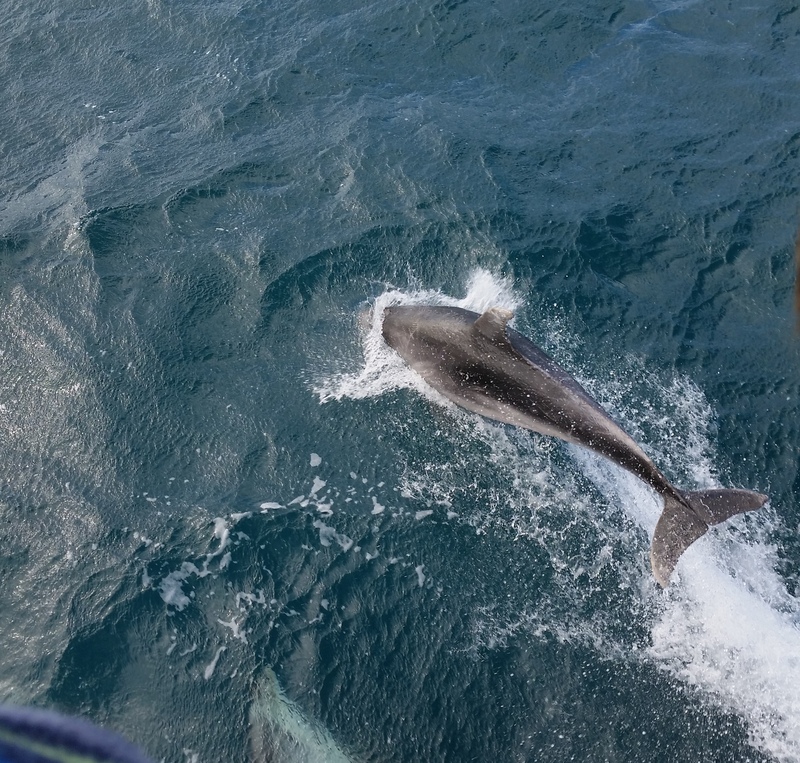 It’s not easy to time the photos to catch the dolphins as they leap out of the water, or as they twist and splash back under the surface. 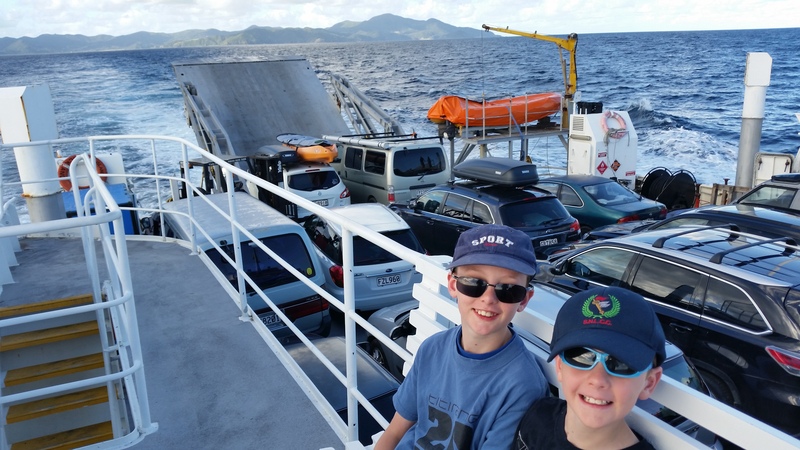 They seem pretty happy – maybe meeting the ferry might be the highlight of their day too. I manage many photos of water with dolphin-shaped shadows lurking below. 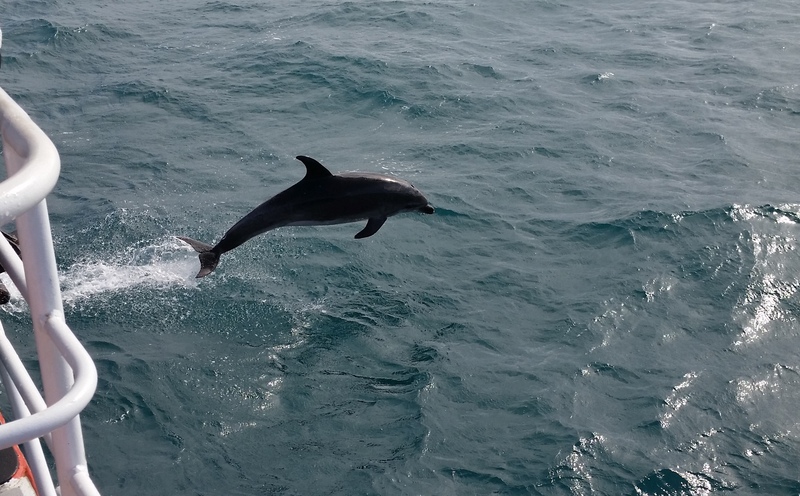 Fortunately some dolphins manage to time their jump well. We have no way of locking the place yet, so we lie around reading up on our options for the week, and it isn’t too long before we’re greeted by Jazz the jumpy dog and her owner. We’re given a quick tour and told not to worry about the constant smell of gas in the kitchen – my boys still choose to worry. Sadly the horse just died – “You should have been here last week”. On a brighter note, the tour includes a socket in the owners’ garage, so I can recharge my phone in the evenings. I later find that phone reception is limited to a spot half-way down a long driveway, which strangely shifts every day. The neighbour’s cows seem to find my careful steps forward and backward quite intriguing. It probably looks more foxtrot than waltz. On finding that the torch is broken, which should arguably have been checked before leaving home, we head off, looking for a replacement and some dinner. 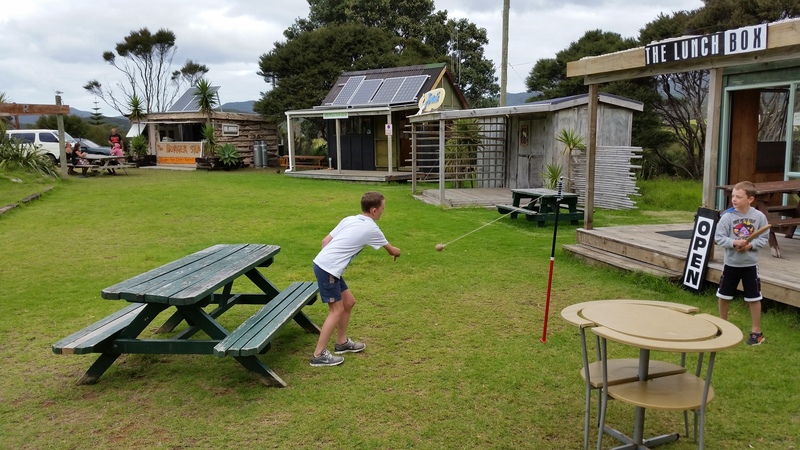 We find a warm welcome and delicious vegie pizza at the Lunch Box café in Claris, although their swing ball would be better if there was a ball attached. There’s also a distinct lack of torches in the local shops. Tonight the phone will have to double as a torch. Sam wakes just after midnight, and we use the phone to navigate our way to the toilets. It’s a perfectly clear night, and we can hear the occasional morepork. There’s no light pollution on Great Barrier and the sky seems completely full of stars. We’ve decided to see as much of the island as possible by driving in a different direction every day. Today we’re heading south and our first stop is the General Store in Claris. I’m sure someone is just ahead of us, buying all the torches on the island. There’s no shortage of bread in Claris, but no-one ever used a sandwich to find their way in the dark. 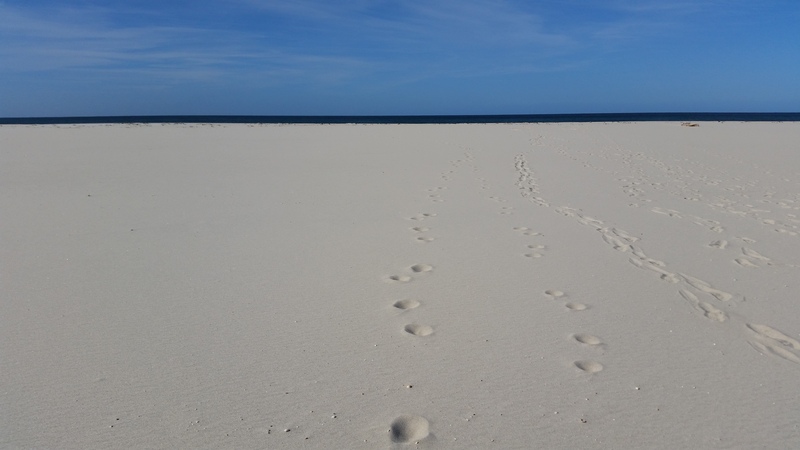 The beaches on the East coast of Great Barrier are spectacular, and we have a brief stop at Medlands with plans to return for a longer visit later in the trip. The southern-most point on the island is Cape Barrier, and we’re heading to Cape Barrier Road to see how close we can get. The map shows the road as unsealed, but that’s no problem. It’s only an issue for us if the map were to show the road as 4WD only. After about half-an-hour, the map lies to us, and we’re confronted with a 4WD sign. We decide that eating is our best option, and that the side of this seemingly rarely-used road is the ideal spot to lay out our blanket for our picnic. It won’t be the last time the boys have sandwiches and fruit for lunch. 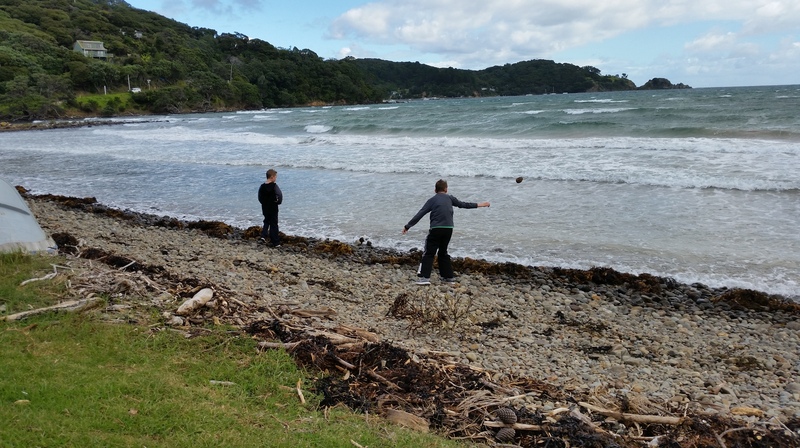 We finish lunch with a feijoa peel throwing competition into the neighbouring farm. We head back home to Blind Bay via Tryphena, where the ferry arrived, and where we find some interesting-looking rock pools. There’s a disappointing lack of beasts in the pools, so have a session on the correct technique for skimming stones. After much perseverance, Dom has his first success. On the way home, we find the last torch on the island at the Mulberry Grove Café (they missed one) and have quick photo stops at what I think is Pah Beach. Dinner tonight is the famous toasted sandwiches from the Burger Shack in Claris, followed by fruit salad specially imported from Auckland. The highlight for two of us today is the Kaitoke Hot Springs, reached after a 45 minute walk through the Kaitoke wetlands to hot pools. There are numerous signs for rare birdlife that can be found here, and we’re on the lookout for a bittern. The bitterns may be having a sleep-in today, so we keep an eye out for unusual looking mushrooms. 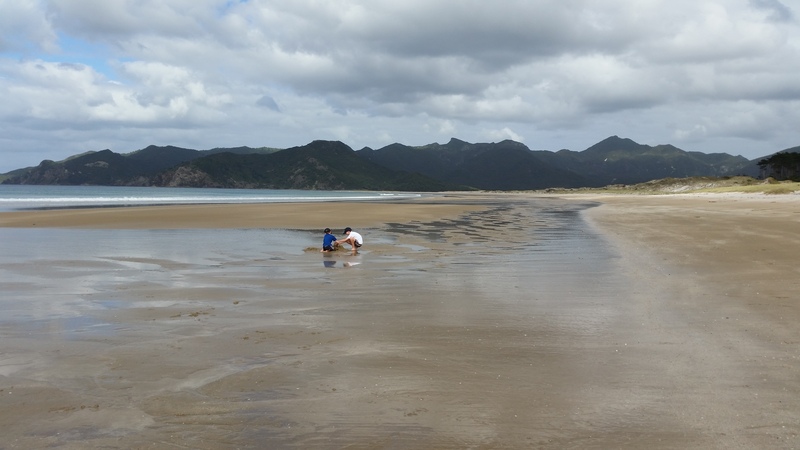 The pools are very secluded – you can’t get much more secluded than at the end of a long trail on Great Barrier. A family is just leaving as we arrive, and we have the pools to ourselves for a while. The bottom the pools is very muddy, with the temperature in the mud quite hot at one end of the pool. We’re soon joined by a Banded Rail, now rare on the mainland, but not uncommon on Great Barrier. Dom’s enjoying lounging in the pools, but with splashing and swimming under water not allowable options, Sam’s soon getting bored. 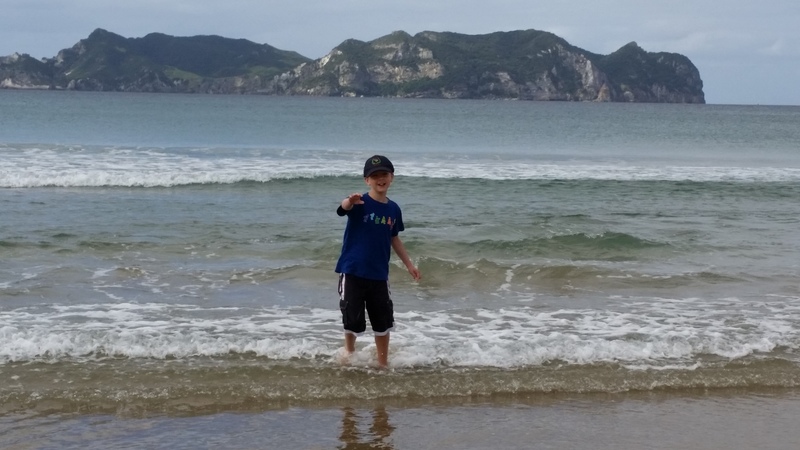 We’re joined by a family getting away from the Waiheke Island rat-race, which says a lot for the pace of life on Great Barrier, and we leave them to enjoy the pools. A lot rarer on Great Barrier than the Banded Rail is the traffic jam – but we manage to experience both on the same day. 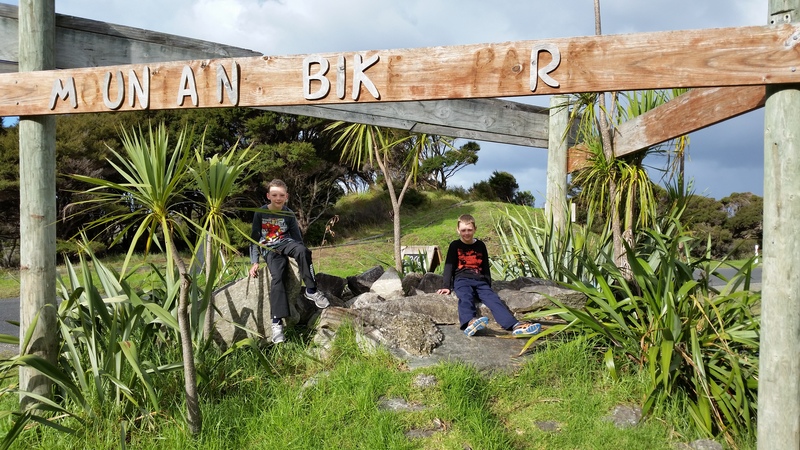 We picked the wrong day to see what could be found at the end of Whangaparapara Road – and we never did find out. 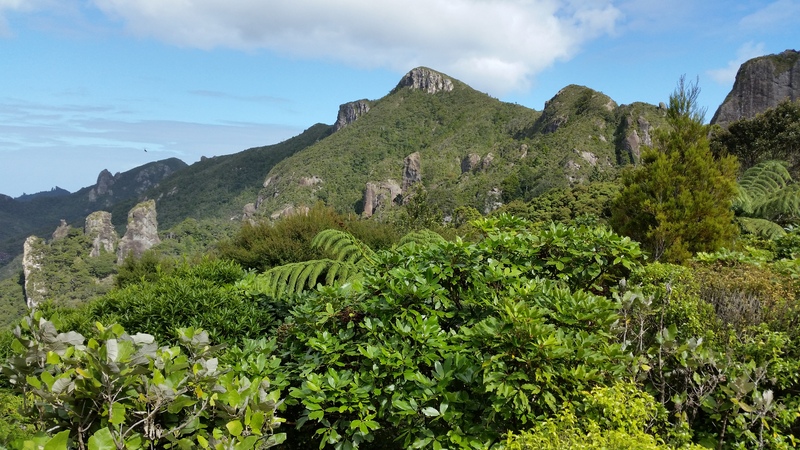 We do find a sign to Harpoon Hill – given the history of whaling in the early years of European settlement, it must have a view. No chance – it does have houses that look exactly like our street back in Auckland. The name promised so much. Another treat for the boys is the chance to have a request played on the local radio station with their names announced. 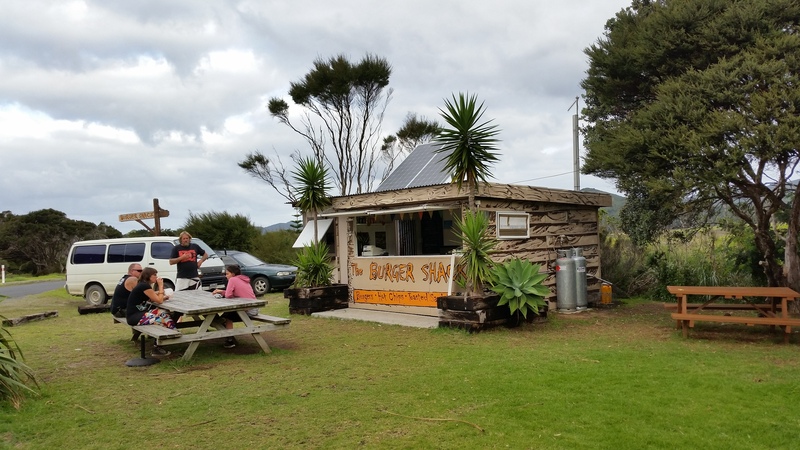 AoteaFM is based in a cabin at Claris between the Burger Shack and the Lunch Box – possibly situated to keep two rivals at bay. The boys have the chance to choose the last track for the session and their blank looks mean I choose it for them – Jokerman by Bob Dylan. 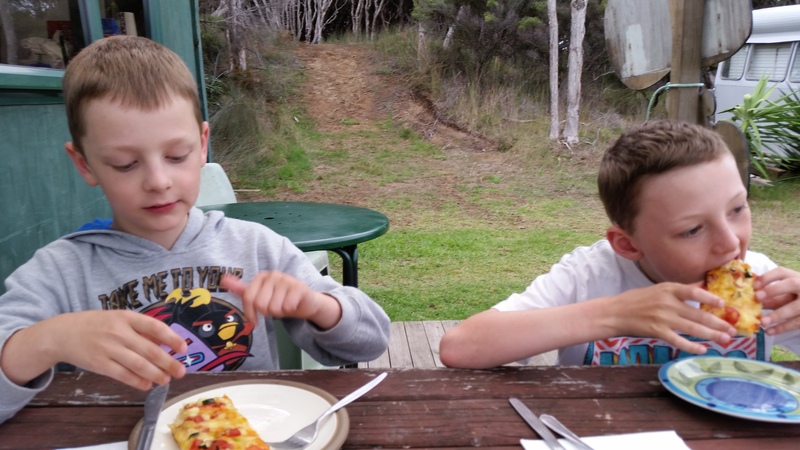 They get quite a kick out of alternating between listening from the car radio and from the speakers in the picnic area outside the cabin, and back again, and back again…. 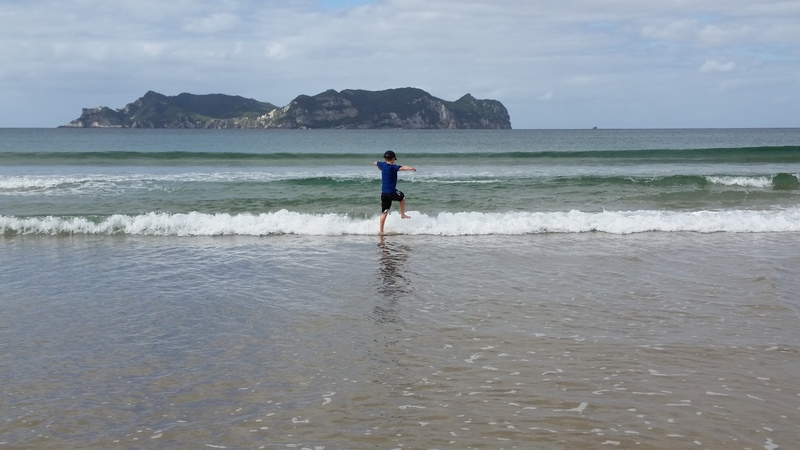 We finish the day with a swim at Medlands beach – freezing at first, but once your body losing all feeling, it isn’t so bad. It’s hard to complain about the east coast beaches here. The simple tricks are usually the best. 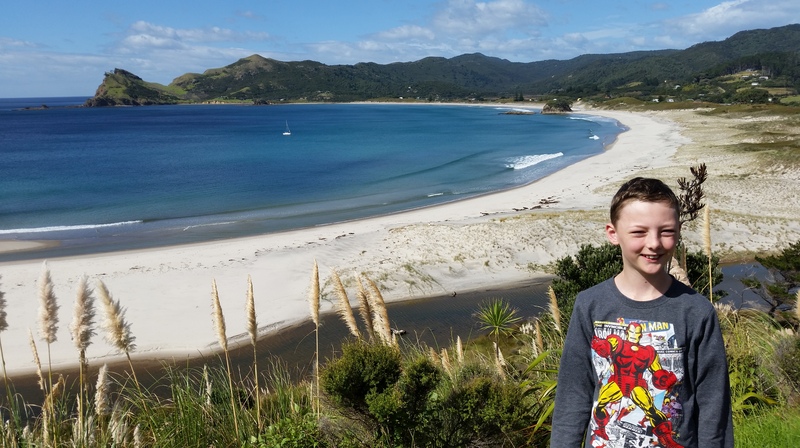 We’re heading north today, with an initial stop at Blind Bay, the beach that we’ve driven past at the beginning and end of each of the last few days but have yet to visit. Sam decides that the easiest way to identify the various beaches in our photos is to write the name on the beach itself with some handy driftwood. Fortunately the name of our first beach today is quite short. On the drive north, we see spectacular views over Awana Bay from road – this is the place where I’d love my GBI bach. 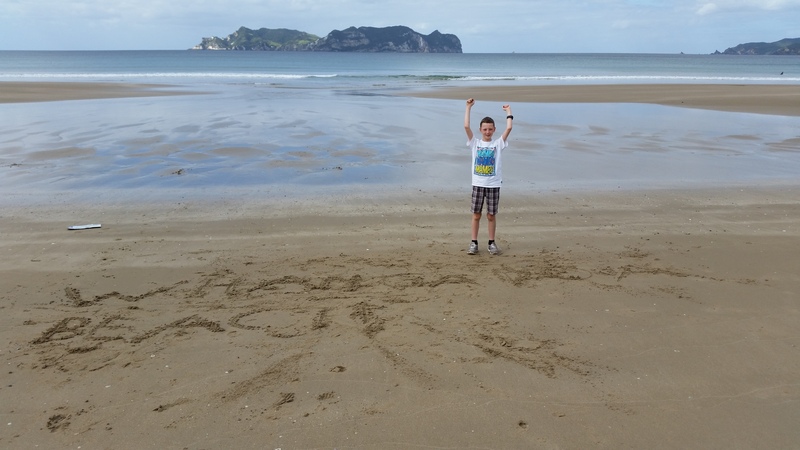 It won’t happen – too hard to get back to Auckland for the gigs. We head down to the beach for more tagging on the sand. Our main target today is Windy Canyon – it’s not clear whether the name refers to the wind blowing through the hills, or the winding of the road. Both would have worked today – I’m not sure you get that many double entendres in place names out here. Our lunch is at a handily positioned picnic table opposite the entry to Windy Canyon lookout. The fact that there is a quarry next to the picnic table makes it feel a bit out of place, but we have a very interesting view of impressive rock formations above us. We walk to the lookout, unfortunately past one very large but very dead bird. There are many rare birds on Great Barrier. If this was a rare one, sadly they’re even rarer now. The end of the walk to lookout gets a bit hairy with very high and steep stairs, and ample opportunity for a long fall. The boys do well though, but we’re all happy to stop when the handrails disappear. I get to go a little further despite the lack of handrail for the official photo. 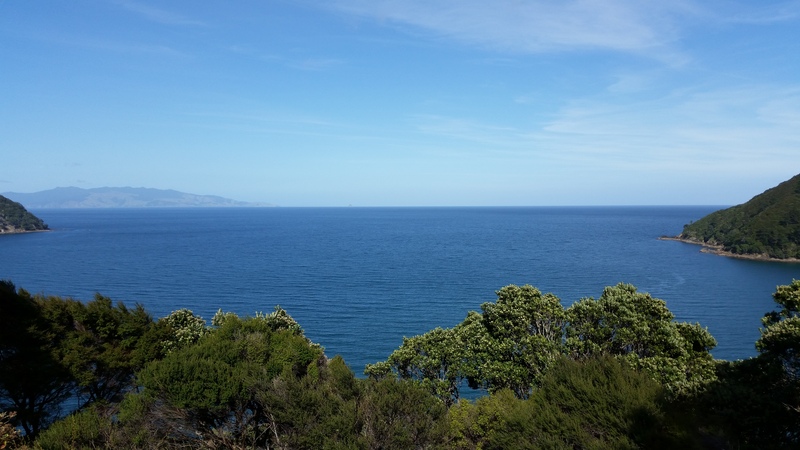 It’s a great view towards the coast at Okiwi – sometimes quick views are the best views. 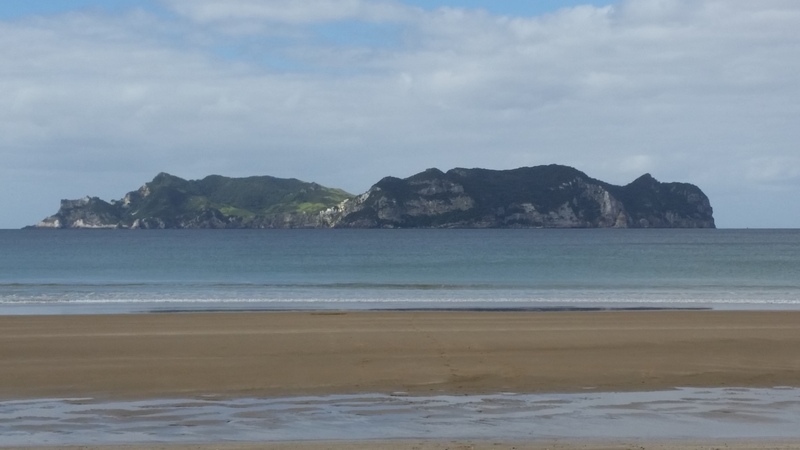 We continue north down the unsealed road to Whangapoua Beach. 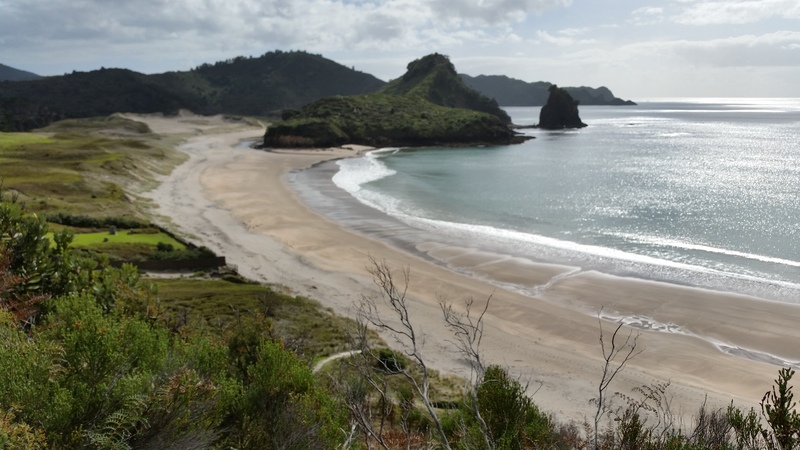 This beach is the location for graves from one of New Zealand’s worst shipwrecks, the SS Wairarapa. The ship hit rocks near here in October 1894, causing 140 people to drown. 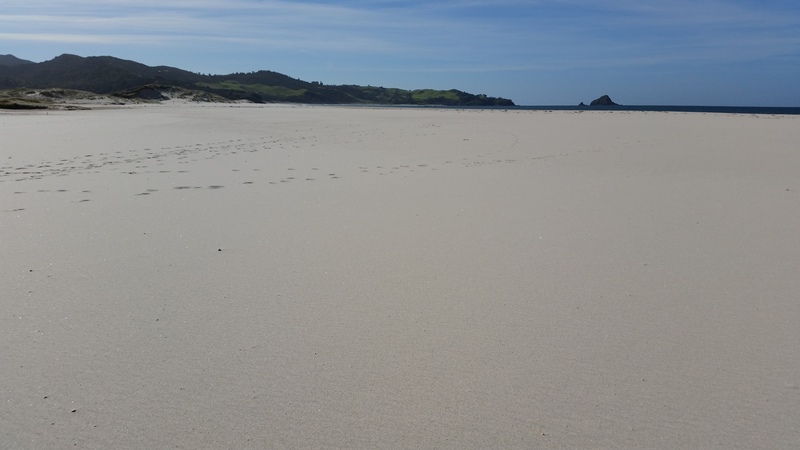 We share the two kilometre-long beach briefly with another human family, and then only with a family of dotterels. 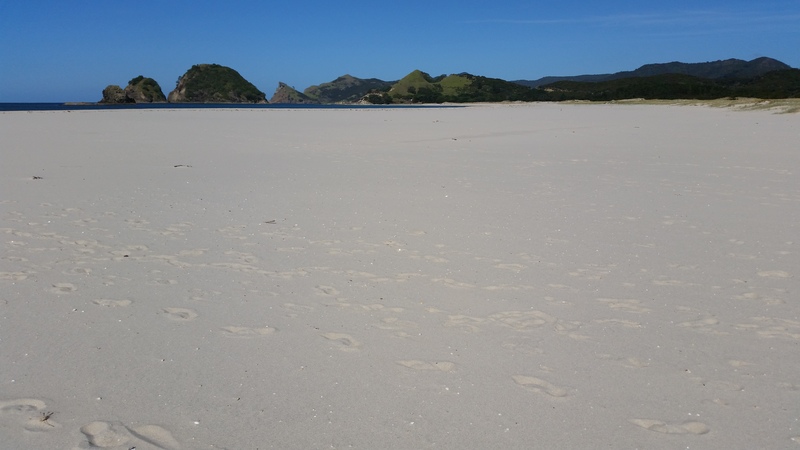 The beach looks directly out towards Rakitu Island, also appropriately known as Arid Island. 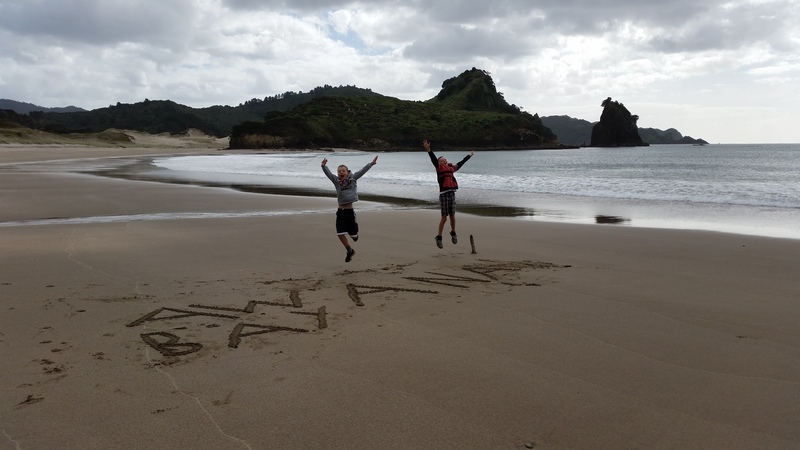 The boys do more beach-naming, but it’s a bit tricky with dryer sand and a lot more letters. 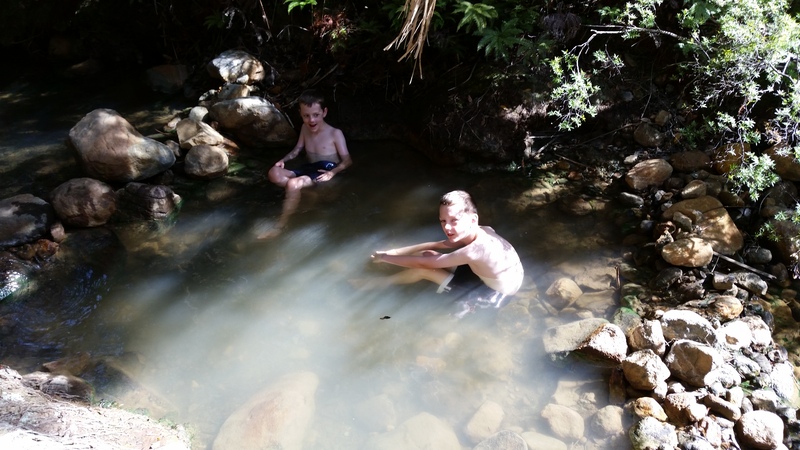 They have a great time doing what kids have always done – jumping waves, digging holes, making dams. It’s the perfect beach. Less than perfect is having to share the portaloo with an angry bee – a very unwelcome and untimely visitor. From there we drive to Port Fitzroy – I can’t remember why I thought this was going to be the biggest town on the Island. 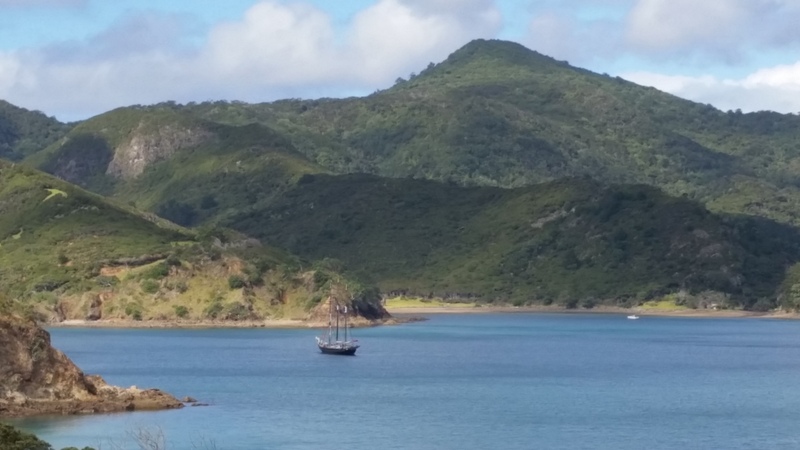 Far from it – it consists of a jetty, a caravan selling snacks, an overpriced fruit and vege shop, a few recycling bins and another spectacular setting. There must be houses up the long drives around here, but nothing very visible. It’s a great place to relax with an ice cream, and amazingly the only place right on the jetty doesn’t do ice creams. We pop up the road for some overpriced ice creams and bring them back to jetty. This is a beautiful spot. We have dinner at the Lunch Box again – and they’ve attached a ball to the swingball. They have bats too; a nice touch. It’s our last taste of the vegetarian pizzas for this trip. On the way home we have a quick sidetrip to Blind Bay, but Sam’s writing has long gone. The much requested fishing day has arrived and we pay a visit to Hooked On Barrier to buy bait. It’s suggested we get squid, as that won’t come off the hook. I should have asked for that in writing. 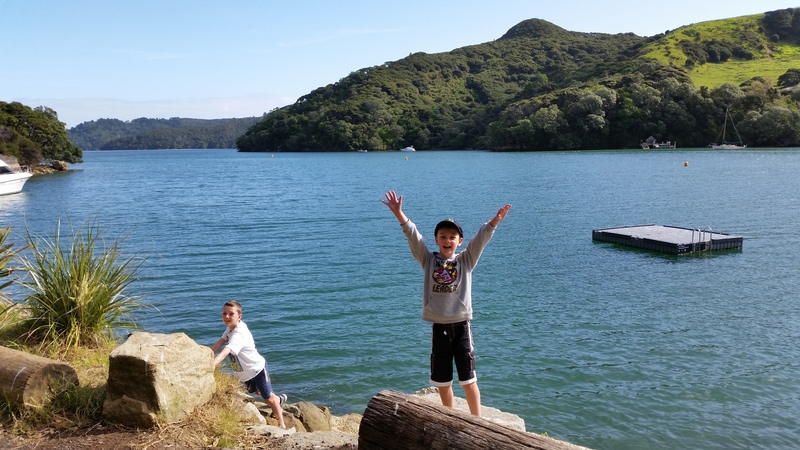 We’re also told that the jetty at Blind Bay is a good spot, which is perfect for us. There are very nice views across the bay to Okupu. The weather is a bit cool, but we’re all well wrapped up. The boys haven’t used handlines before, and I help them by slinging the lines out. We’re soon getting bites – it’s a promising start. All goes quiet and we check our lines – no bait. These guys are cunning. More sophisticated baiting follows, with the same result. Biting followed by missing bait. The weather’s now getting a bit damp as a drizzle sets in, but the boys aren’t put off by that. A pattern is starting to emerge – bait is hooked by man, bait is unhooked and eaten by fish. The weather is not improving, and gets wetter and colder until we suddenly find ourselves in an outdoor carwash. Our slightly cool day with possible rain has turned into a torrential downpour with a chance of sunshine late tomorrow. At least we have a shed on the jetty for shelter and to untangle two interwoven handlines. The rain eases enough for the boys to venture out again. And once more, we get many bites, but these fish want to eat in, not takeout. I’m amazed we’re still getting bites – surely they must be full by now. We’re joined by a collie who looks curious and confident we’ll get something. His mood slowly descends into despondency and I don’t think he wants to be associated with us. The boys don’t give up until we run out of bait. We head home for the big clean, wondering what we would have done if we had have caught a fish. This would have been at odds with my anti-whaling stance anyway, so my conscience is clear. Somehow even the clothes that we weren’t wearing today smell of bait. 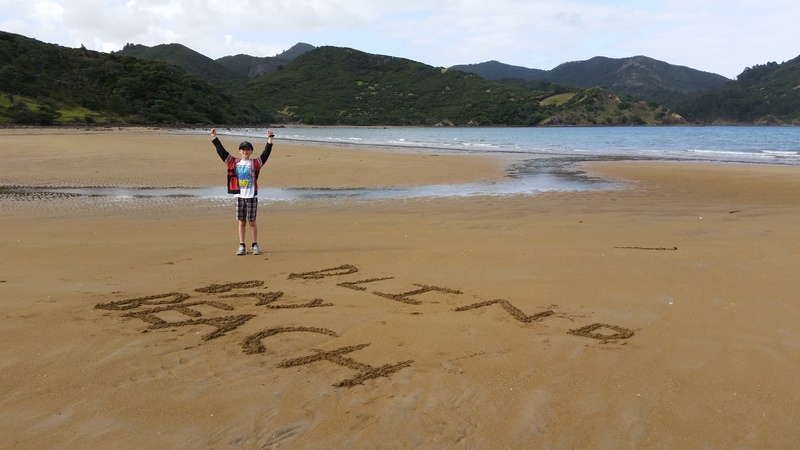 It’s the last morning of our Great Barrier Island tour, and it’s time for the big tidy. We finally meet the husband of the owner and he has only marginally more to say than when he wasn’t around. We’re not sure what food options will be available on the ferry back so we grab a combined morning tea and lunch at Mulberry Grove road. The crew of the ferry are playing cricket on the parking deck, but the game has to finish to load cars. The boys watch while I reverse on. When I get back, Dom has camouflaged his face with a chocolate cupcake, and we leave a trail of chocolate crumbs as we embark. There are a lot more people on the ferry this time, so we make sure we get a good seat to watch the islands go by. We’ve become quite familiar with this coastline quite quickly. After we run out of islands to watch, the boys finally get to watch their Mythbusters DVD. The ferry takes a few hours so we make this last as long as possible. We buy the only food available on board that could arguably fit within a very broad definition of dinner. 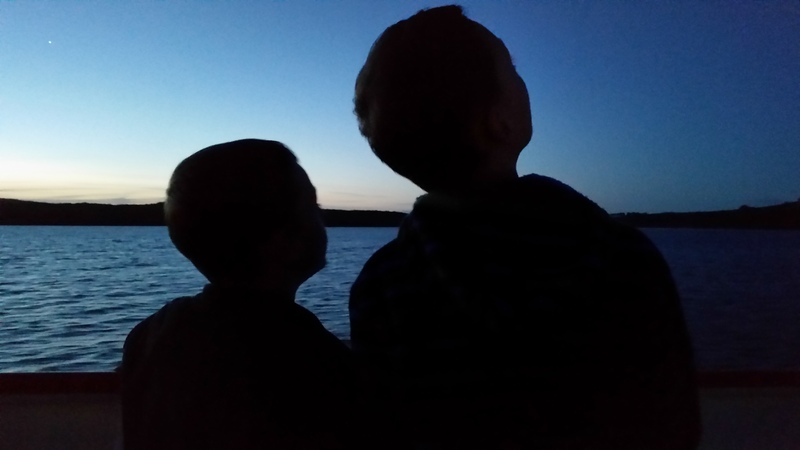 There aren’t any dolphins this time, but darkness soon falls and the boys have a clear sky to watch Venus and Jupiter. Quietly cruising past the night lights of Auckland harbour is a fun way to finish the trip. The boys haven’t seen this view of the city at night before. They seem happy to have had their trip away from it all, but I’m sure they’re just as happy to get back, find their chargers, and plug in again. 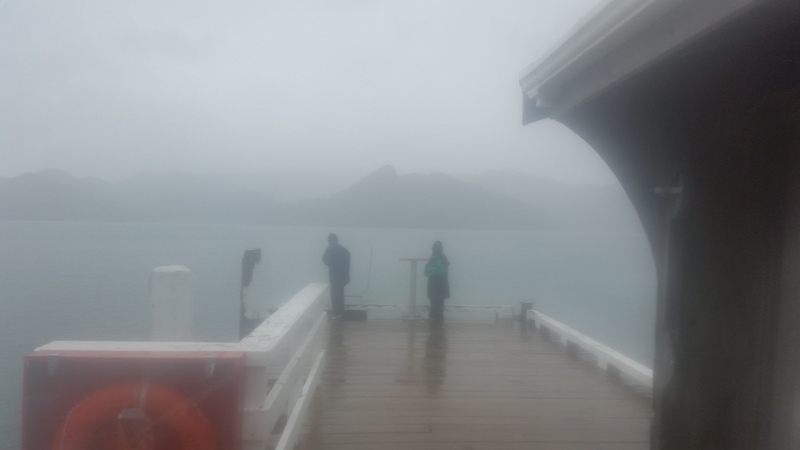 This entry was posted in Travel and tagged AoteaFM, Arid Island, Awana Bay, Banded Rail, Blind Bay, Burger Shack, Claris, dolphins, ferry, fishing, Great Barrier Island, Jupiter, Kaitoke Hot Springs, Lunch Box cafe, Medlands, new zealand, Port Fitzroy, travel, Venus, Whangapoua Beach, Windy Canyon. Bookmark the permalink. Fantastic. I really regret not having been there…. yet! Yet – that’s the key word! I hope it’s far enough away from Auckland not to change too quickly. It’s a truly amazing place! Thanks for sharing your impressions!